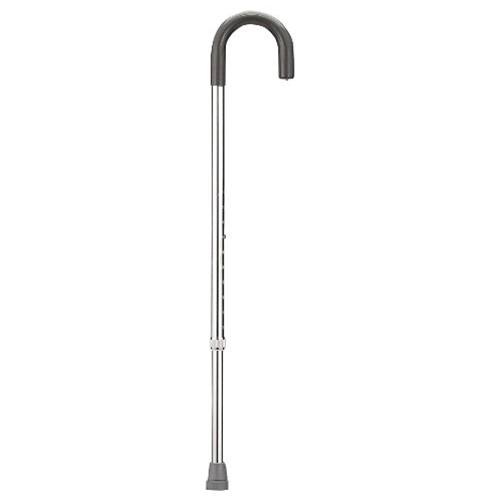 McKesson Round Handle Aluminum Cane from HealthyKin.com is manufactured with sturdy, extruded aluminum tubing. It is easy to use, with a one-button height adjustment and locking ring. The locking ring prevents rattling. Handle height adjusts from 29.75" to 38.75"
We bought this cane to match a cane we already have as my wife now needs two canes when walking outdoors. This cane works well. I bought this cane to help with poor balance and walking weakness secondary to low back pain. The cane is well made and very inexpensive. I would recommend it to any anyone. The service was also excellent. It would be nice to include a note on how to clean the foam grip. Great cane. Don't hesitate to order. The price and shipping were excellent. Perfect price and arrived quickly. Shipping cost was a little high. Just what I needed and the price and service were great!